Estonia is occupied by Nazi Germany. Early on the morning of August 24, 1939, the Soviet Union and Nazi Germany signed a 10-year non-aggression pact, called the Molotov–Ribbentrop pact. Most notably, the pact contained a secret protocol, revealed only after Germany’s defeat in 1945, according to which the states of Northern and Eastern Europe were divided into German and Soviet “spheres of influence”. In the north, Finland, Estonia and Latvia were assigned to the Soviet sphere. Poland was to be partitioned in the event of its “political rearrangement”—the areas east of the Narev, Vistula and San Rivers going to the Soviet Union while Germany would occupy the west. Lithuania, adjacent to East Prussia, would be in the German sphere of influence, although a second secret protocol agreed in September 1939 assigned the majority of Lithuania to the USSR. Most Estonians greeted the Germans with relatively open arms and hoped for restoration of independence. In Southern Estonia pro-independence administrations were set up, led by Jüri Uluots, and a co-ordinating council was set up in Tartu as soon as the Soviet regime retreated and before German troops arrived. The Forest Brothers who drove the Red Army from Tartu made this possible. This was all for nothing since the Germans disbanded the provisional government and Estonia became a part of the German-occupied Reichskommissariat Ostland. A Sicherheitspolizei was established for internal security under the leadership of Ain-Ervin Mere. The initial enthusiasm that accompanied the liberation from Soviet occupation quickly waned as a result and the Germans had limited success in recruiting volunteers. The draft was introduced in 1942, resulting in some 3400 men fleeing to Finland to fight in the Finnish Army rather than join the Germans. Finnish Infantry Regiment 200 was formed out of Estonian volunteers who had fled the 1943–1944 forced mobilization into the German forces in Estonia. The unit fought the Red Army on the Karelian Front. In June 1942, political leaders of Estonia who had survived Soviet repressions held a meeting hidden from the occupying powers in Estonia where the formation of an underground Estonian government and the options for preserving continuity of the republic were discussed. On January 6, 1943, a meeting was held at the Estonian foreign delegation in Stockholm. In order to preserve the legal continuation of the Republic of Estonia, it was decided that the last constitutional prime minister, Jüri Uluots, had to continue to fulfill his responsibilities as prime minister. In June 1944, the elector’s assembly of the Republic of Estonia gathered in secrecy from the occupying powers in Tallinn and appointed Jüri Uluots as the prime minister with responsibilities of the President. On June 21 Jüri Uluots appointed Otto Tief as deputy prime minister. With the Allied victory over Germany becoming certain in 1944, the only option to save Estonia’s independence was to stave off a new Soviet invasion of Estonia until Germany’s capitulation. By supporting the German conscription call Uluots hoped to restore the Estonian Army and the country’s independence. The first USA Labor Day parade is held in New York City. 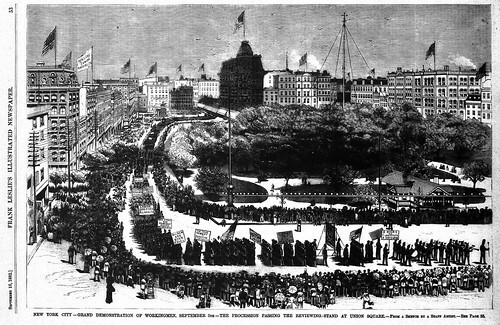 New York City hold the first United States Labor Day parade. Cassius Clay (Muhammad Ali) wins the gold medal in the light heavyweight boxing competition at the 1960 Olympic Games in Rome. Muhammad Ali is awarded the gold medal for the light heavyweight at the Olympic Games in Rome. The St. Gotthard Tunnel opens in Switzerland. It is the world’s longest highway tunnel at 16.224 km. Pan Am Flight 73 is hijacked at Karachi International Airport.